Florida is a unique land mass comprised of limestone and an underlying substructure that creates an environment that is prone to sinkholes. Limestone and similar soil aggregates are known to be prone to erosion leading to the formation of a problematic sinkhole. Sinkholes are formed when the limestone deteriorates giving way to fissures and openings that are fueled by water containing acid that interacts with limestone. As the limestone is dissolved, the sinkhole expands and becomes more dangerous. As the sinkhole expands in size, the land’s surface may begin to cave in. Weight on the surface of the ground can lead to a collapse, drawing down with it anything in the surrounding area. Depending on the magnitude of the hole, there have been incidents of entire homes, cars and other such things being engulfed by this natural catastrophe. At Triad, we know just how traumatic a sinkhole can be. We stand ready to assist our clients in managing the aftermath caused by this phenomenon to mitigate the associated damage caused by the collapse. We will work diligently to get your residence or office restored to its previous state so you are able to return to your life. 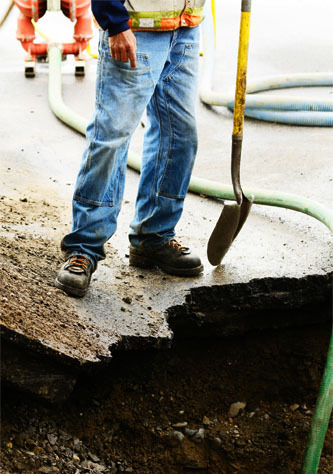 Our team of Florida sinkhole restoration specialists are fully licensed by the state and insured to protect you. We’ll repair and restore your valuable property using only the most effective industry-standard techniques to yield the best possible results. We have the knowledge, experience and know how to help you recover in a timely manner and we get the restoration completed correctly and quickly. No matter how large the disaster, our crew can tackle the trouble. We assess the best way to approach the problem to get the damages caused by the sinkhole under control. It’s not enough to patch the problem, you must take the extra steps to ensure that the problem doesn’t come back in the future. We get it right from the start. Give us a call to get your property back in a safe and working condition now.